We were asked to track down a witness to a vehicle accident, however, the witness was suspected of being a friend to the claimant and it was doubtful that he had actually been present to observe the accident. The witness lived in a government housing project in East Los Angeles and had been very uncooperative, but finally agreed to set an appointment for a statement one evening in November. 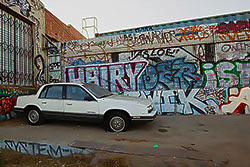 The neighborhood was infamous in East L.A. as the site of a shooting of two German tourists a few years prior, who had driven off the 10 freeway at the wrong exit. On the night of the appointment our adjuster drove to the neighborhood only to discover that all the street signs had been ripped from their poles, making it extremely difficult to locate the witness’s apartment. It was beginning to get dark, but undaunted the adjuster began asking anyone he could find on the street as to the location of the building he was looking for. He questioned 17 people that night, including several gangbangers who were heavily wallpapered with tattoos, and even several L.A. police SWAT (Special Weapons and Tactics) team members with guns drawn and night vision equipment before finally finding the apartment, and amazingly arrived only a few minutes late for the appointment. As the witness’s version turned out to be not credible, the claim was ultimately denied. No matter what the situation, including dangerous environments, uncooperative witnesses and even the lack of street signs, Churchill will always do what’s necessary to get you the facts!